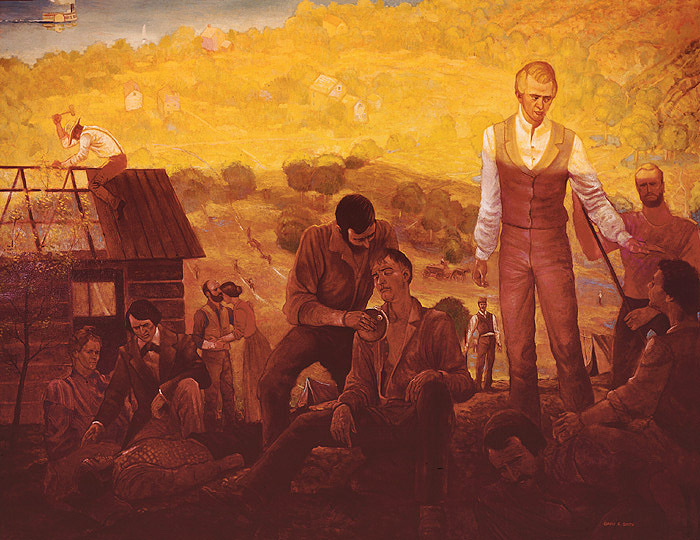 Sign up for Meridian’s Free Newsletter, please CLICK HERE Cover image: Healing in Nauvoo, by Gary Smith. The articles are based on the book “Joseph Smith and Herbal Medicine” by John Heinerman, (referred to in this article as JS&HM) Bonneville Books in 2009. “I preached to a large congregation at the stand, on the science and practice of medicine, desiring to persuade the Saints to trust in God when sick, and not in an arm of flesh, and live by faith and not by medicine, or poison; and when they were sick, and had called for the Elders to pray for them, and they were not healed, to use herbs and mild food.” Documentary History of the Church, Volume 4, p. 414. This would have been comfortable counsel for the early saints in Nauvoo who had emigrated to Nauvoo came from other religions where most were well read in the Bible. For many, it was their primary source of reading and schooling. Both the Old Testament and the New Testament, along with the Savior’s sermons, have frequent mention of plants and herbs, so this was a familiar source of reference. Under the influence of these brothers, Joseph established a Board of Health in the early 1840s that advocated the use of herbs and botanical medicine, but greatly restricted others who did not know herbs and how to use them. There was even a dentist in Nauvoo who followed the Thomsonian Botanical method, Alexander Neibauer. He was a Jewish man from Prussia who was the first Jew to be baptized into the church. He was introduced to the gospel and baptized along with his wife in 1838, while studying dentistry in Preston, England. He even went so far as to set some men and women apart to the office of ministering unto the sick, including women to serve as midwives and nurses. Ann Carling was one of three specially called midwives he personally set apart. In her blessing she was told that she would be successful in caring for the sick if she would use herbs exclusively in her work. Some years later in Utah she became known as the “herb doctor,” personally growing and processing the herbs for the use of her patients. Other women were set apart as “nurses in Israel.” They would sometimes accompany him on his rounds to the sick, and assist in administrations to them. A Dr. Calvin Crane was also set apart to care for the sick. He made remedies from roots and herbs that he gathered and compounded into pills. As would be expected, the midwives had a strong bond of sisterhood and worked together. They met and discussed the spiritual aspects of their work, quoting Joseph Smith, Brigham Young and proclaimed the blessings of health and mercy for their patients that they had experienced after being set apart. Patty Sessions, one of the three midwives, became one of Utah’s foremost early midwives. Her medical reports were very objective, but her personal journals revealed her deep testimony of the restored gospel, and the inseparable nature of practicing medicine while serving God under the mantle of the Priesthood. Salve for old sores: Bark of indigo-weed root, boiled, beeswax, mutton tallow, and a little rosin. Bowel complaint: Take one teaspoonful rhubarb, one-fourth carbonate of soda, one Tbsp. brandy, one tsp. peppermint essence, half-cup of warm water. Take by the tablespoonful once an hour until the bowels move. Heartburn: Laudanaum, carbonate soda, ammonia, sweet oil, camphor. Also good for milk leg inflammation or sweating. Even with their training and settings apart, however, these early health leaders considered and used faith in the Lord to be their first tool for healing. They called upon His name in prayer, then exercised their commission for the laying on of hands. They asked their patients to call upon the Lord with faith and prayer as well. To these doctors and nurses in Nauvoo, “God, with the all-seeing eye and the never-failing ear, was always the greatest doctor of all. When death came to a patient, it was the Lord’s will. They followed the Prophet’s faith and example, which was not unlike many other religious leaders in advocating faith healing. There were some members of the Church who believed that all disease was caused by the Devil and that faith should cure all. This led to problems and even became a matter for discussions at High Councils. The Prophet is quoted as saying, “It is not lawful to teach the Church that all disease is of the Devil. But if there is any that has this faith, let him have it to himself. If there are any that believe that roots and herbs administered to the sick and all wholesome vegetables which God has ordained for the use of man, and if any say that such things applied to the sick in order that they may receive health, and this applied by any member of the Church … if there are any among you that teach that these things are of Satan, such teaching is not of God.” (L.D.S. Church Historian’s Office, entry for August 31, 1834). The emphasis on this comment is that these are teachings, not hard policies worthy of serious rebuke. Documented time and again are the stories of healings that reveal Joseph’s belief that the first source of healing was faith in the Lord Jesus Christ, and then it was to “follow the Savior himself, who frequently made reference to herbs in his teachings. 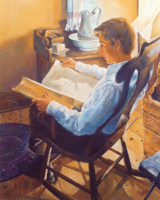 Joseph Smith sought to follow the Savior’s life in every respect, even to the inclusion of herbal medicine in his way of living, which he strongly endorsed and encouraged the early Saints to do as well.” (JS&HM, page 36. )In my next article I will discuss revelation and herbs, and introduce Brigham Young’s feeling on health, herbs and medicine. Carolyn Allen is the Author of 60 Seconds to Weight Loss Success .She has been providing mental and spiritual approaches for weight loss success both online and in the Washington, DC community since 1999 presenting for Weight Watchers, First Class, Fairfax County Adult Education and other community groups in the Washington, D.C. area. She has been providing health information at Meridian since 2007. She and her husband Bob share My Miracle Detox online and here at Meridian. It is an herbal detox keeping with the Word of Wisdom, now used by Meridian readers and missionaries everywhere. CLICK HERE. She is mother of five and the grandmother of a growing number of delightful grandsons and granddaughters and lives with her husband, Bob, in Jackson Tennessee where she serves as an Activity Day leader.